Generally, two main foehn directions can be distinguished. The typical foehn, called "south foehn" (on the north side) is characterized by a southerly flow over the Alps whereas the "north foehn" (on the south side) occurs when the flow over the alpine ridge is oriented from sector north. With a southerly Foehn wind situation, the alpine ridge acts like a barrier. The humid air mass coming from the Mediterranean Sea flows towards the Alpine ridges. As the air rises, humidity condenses to clouds and causes precipitation on the windward (south) slope of the Alps. Precipitation can last for several days (sometimes even weeks) and may lead to considerable amounts of precipitation during short time, due to occurring embedded CB. The cloud cover can be very persistent with a low ceiling and a poor visibility. The southerly flow situation is frequent in autumn and spring, less frequent in winter, but can rarely occur even in summer. 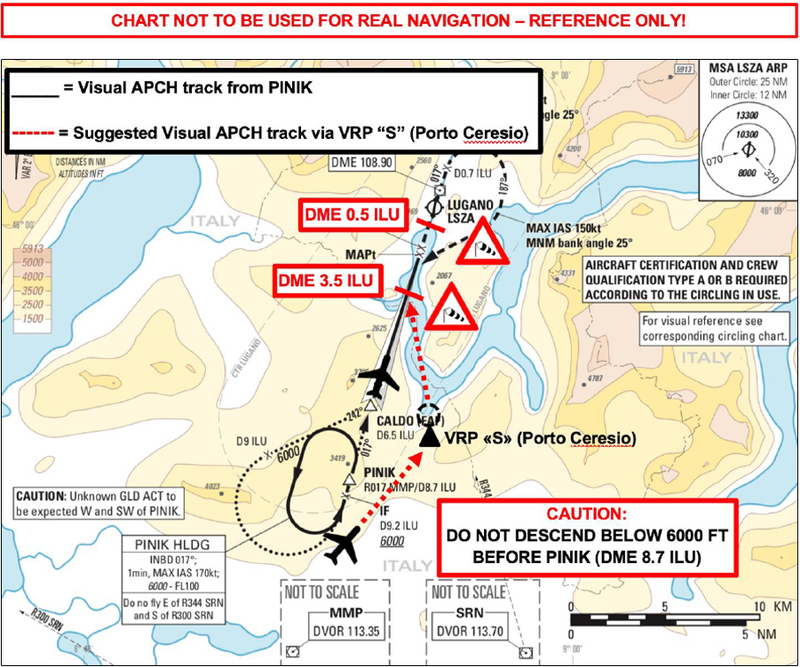 Strong tail-wind condition may be encountered at PINIK during the initial part of the approach, resulting in an increased GS, thus an even more pronounced rate of descent. Strictly monitor your glide slope during descent to Minima and adjust your rate of descent accordingly. A northerly flow over the Alps can trigger North foehn which, depending on the magnitude of the upper flow and of the pressure gradient between north and south side of the Alps, affects the valleys on the lee side of the Alps. In order to reach Lugano Airport, a sufficient pressure gradient is needed. The Foehn wind manifests itself in a rapid increase in temperature and a significant decrease in air humidity (dew point) in the affected area. Also, severe clear air turbulence associated with terrain induced turbulence and low level wind gusts occur. The gustiness of the Foehn, which is called Favonio in Lugano, is significant. Gusts may reach 2 up to 4 times the mean velocity of the wind. During snow events, the main issue is a worsening of the visibility conditions. In Lugano, snowfall normally occur from November to March but mainly between December and February. Overall 7 to 10 days heavy snowfall is estimated throughout a year. Note that Lugano Airport is equipped with snow removal equipment’s. This situation can sometimes occur, but is more frequent in autumn and winter. The SC clouds mostly dissipate 3-5 hours after sunrise and only rarely last for the whole day. Above the SC layer ceiling and visibility are generally ok. This is the least frequent situation present in Lugano. The moderately moist air over the “Pianura Padana” is pushed to the southern slope of the Alps generating stratus clouds with a ceiling between 2500 - 5000 ft AMSL. (Note: Lugano Airport minima for IFR approaches is between 2000 and 3000 ft). Be advised that Circling Procedure with Stratus Clouds might be challenging due to the presence of scattered clouds around Circling Pattern. This situation usually occurs when a high pressure weakens. It is most frequent during the summer and can persist for several days. During hot days warm air bubbles rise up to the condensation base, where they turn into cumulus clouds. Below the convection clouds moderate to severe turbulence with strong uprafts occur. Thermal thunderstorms are most likely to occur between mid-afternoon and late evening. Frontal triggered thunderstorms, however, can develop at any time of the day. They are usually organized in a storm line approaching Lugano from west or southwest. Both kinds of thunderstorms can be heavy and occasionally accompanied by hail. High Pressure situations can happen at any time of the year and can last from one day to several weeks. They usually last longer in summer and winter. In summer this pattern often degenerates to a flat pressure pattern with air mass thunderstorms. The necessary conditions for radiation fog are clear sky (increased radiation with the development of an inversion layer), low wind speed and high relative humidity. South of the Alps these conditions are usually apparent during the first night with clear sky after a period of precipitation. The formation of radiation fog, which is not connected to a precipitation event, is rarely observed in the region of Lugano Airport. This fog rises into the valleys on the southern part of the mountains and has a very low top (even less than 1000 ft above ground). In Lugano radiation fog is observed during the whole year, but mainly occurs from October to April. Fog doesn’t usually last for the whole day but is concentrated in the morning and evening hours. Even in winter, there is a high chance of fog dissipation during the late morning or afternoon hours. The general weather situation in Lugano is sunny with prevailing southerly wind conditions of 4 to 9 kts. Runway 19 is the preferred runway in use with runway 01 also available on PIC’s discerption. Statistics show that overall 93 days in a year weather conditions like rain, thunderstorm or rarely hail are present. In average, only 25 days in a year fog is present and most of the time it clears up by 11:00 LT. Consider a Take-Off Alternate when taking off from Lugano with marginal weather conditions, look-out for North Italy airports weather during winter period. In summer, especially after a sunny period with high temperatures, the passage of cold air in the upper atmosphere can increase the instability of the air mass and thunderstorms are developed. They are usually active near the main ridge of the Alps. There is an increased chance for thunderstorms in the mountains and hills near the airport compared to the surrounding areas. Situations with light Foehn in summer can trigger a convergence line near the borders between Switzerland and Italy where thunderstorm are likely to develop. 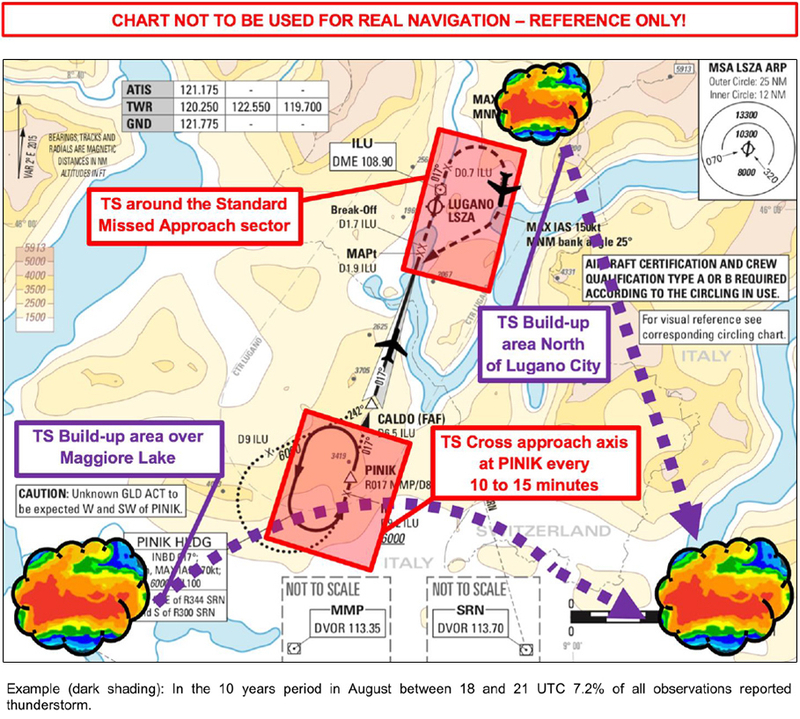 Thunderstorms in built-up areas are usually coming from North East of the airport in the Standard Missed Approach sector and South-West over Maggiore Lake moving with an Easterly direction towards Garda Lake.